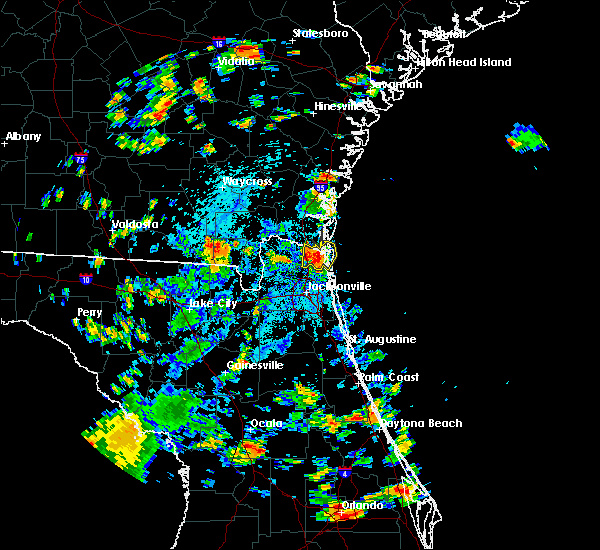 The Kings Bay Base, GA area has had 0 reports of on-the-ground hail by trained spotters, and has been under severe weather warnings 57 times during the past 12 months. Doppler radar has detected hail at or near Kings Bay Base, GA on 41 occasions, including 4 occasions during the past year. 4/19/2019 12:41 PM EDT At 1241 pm edt, severe thunderstorms were located along a line extending from near country club estates to 12 miles east of kings bay base to near hollister, moving northeast at 50 mph (radar indicated). Hazards include 70 mph wind gusts. Expect considerable tree damage. damage is likely to mobile homes, roofs, and outbuildings. locations impacted include, jacksonville, st. marys, brunswick, st. Simons island, fernandina beach, orange park, green cove springs, dock junction, arlington and ponte vedra beach. 4/19/2019 12:26 PM EDT At 1226 pm edt, severe thunderstorms were located along a line extending from near everett to 6 miles west of waverly to near keystone heights, moving northeast at 50 mph (radar indicated). Hazards include 70 mph wind gusts. Expect considerable tree damage. Damage is likely to mobile homes, roofs, and outbuildings. 4/19/2019 11:49 AM EDT At 1149 am edt, a severe thunderstorm capable of producing a tornado was located near hilliard, moving northeast at 50 mph (radar indicated rotation). Hazards include tornado. Flying debris will be dangerous to those caught without shelter. mobile homes will be damaged or destroyed. damage to roofs, windows, and vehicles will occur. tree damage is likely. this dangerous storm will be near, kings ferry around 1205 pm edt. st. marys, kingsland, woodbine and kings bay base around 1215 pm edt. Other locations impacted by this tornadic thunderstorm include colesburg and harrietts bluff. 4/19/2019 11:33 AM EDT At 1133 am edt, severe thunderstorms were located along a line extending from near fort mudge to near raiford, moving northeast at 55 mph (radar indicated). Hazards include 70 mph wind gusts. Expect considerable tree damage. Damage is likely to mobile homes, roofs, and outbuildings. 4/8/2019 5:35 PM EDT At 535 pm edt, a severe thunderstorm was located over yulee, or near st. marys, moving northeast at 30 mph (radar indicated). Hazards include 60 mph wind gusts and quarter size hail. Hail damage to vehicles is expected. expect wind damage to roofs, siding, and trees. 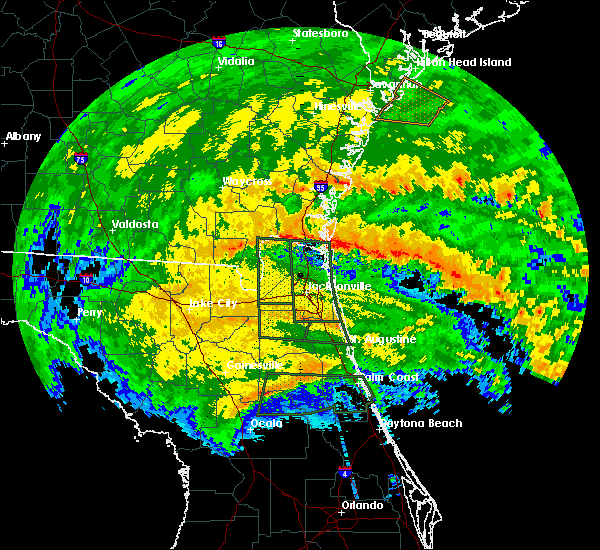 locations impacted include, st. Marys, fernandina beach, kings bay base and yulee. 4/8/2019 5:26 PM EDT At 526 pm edt, a severe thunderstorm was located over yulee, or 7 miles southwest of st. marys, moving northeast at 30 mph (radar indicated). Hazards include 60 mph wind gusts and quarter size hail. Hail damage to vehicles is expected. Expect wind damage to roofs, siding, and trees. 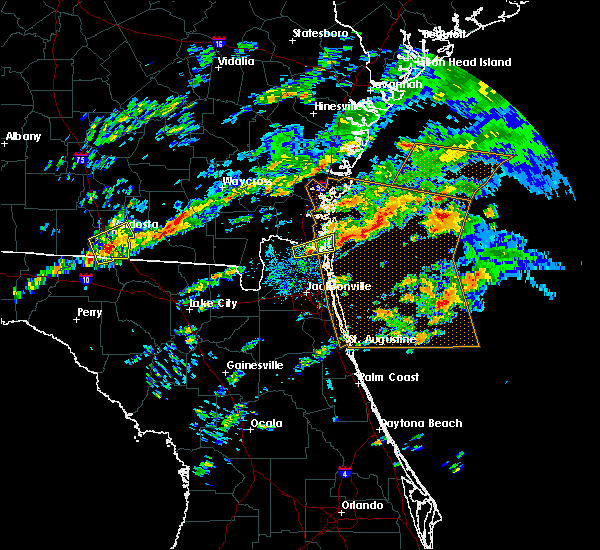 3/1/2019 3:00 PM EST At 259 pm est, severe thunderstorms were located along a line extending from fernandina beach to near cecil field, moving east at 45 mph (radar indicated). Hazards include 60 mph wind gusts. Expect wind damage to roofs, siding, and trees. locations impacted include, jacksonville, st. Marys, fernandina beach, unf, arlington, yulee, neptune beach, ortega, san pablo and craig field. 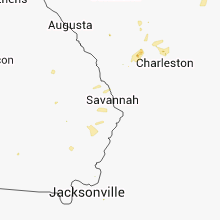 3/1/2019 2:33 PM EST At 233 pm est, severe thunderstorms were located along a line extending from 7 miles southwest of kingsland to 7 miles southeast of sanderson, moving east at 40 mph (radar indicated). Hazards include 60 mph wind gusts and quarter size hail. Hail damage to vehicles is expected. Expect wind damage to roofs, siding, and trees. 12/3/2018 6:43 AM EST At 643 am est, a severe thunderstorm was located near woodbine, moving east at 35 mph (radar indicated). Hazards include 60 mph wind gusts. Expect damage to roofs, siding, and trees. Locations impacted include, kingsland, woodbine, kings bay base, cumberland island, harrietts bluff, dover bluff and colesburg. 12/2/2018 4:53 PM EST The severe thunderstorm warning for northeastern nassau and southeastern camden counties will expire at 500 pm est, the storm which prompted the warning has moved out of the area. therefore, the warning will be allowed to expire. however gusty winds and heavy rain are still possible with this thunderstorm. a tornado watch remains in effect until 600 pm est for southeastern georgia. 12/2/2018 4:26 PM EST At 426 pm est, a severe thunderstorm was located 7 miles north of callahan, moving east at 50 mph (radar indicated). Hazards include 60 mph wind gusts and quarter size hail. Hail damage to vehicles is expected. Expect wind damage to roofs, siding, and trees. 12/2/2018 4:14 PM EST At 413 pm est, a severe thunderstorm was located over southeastern camden county, moving east at 45 mph. rotation aloft continues to be detected with this storm (radar indicated). Hazards include 60 mph wind gusts and half dollar size hail. Hail damage to vehicles is expected. expect wind damage to roofs, siding, and trees. locations impacted include, kingsland, kings bay base, cumberland island and harrietts bluff. A tornado watch remains in effect until 600 pm est for southeastern georgia. 12/2/2018 3:53 PM EST The severe thunderstorm warning for north central nassau and southeastern camden counties will expire at 400 pm est, the storm which prompted the warning has moved out of the area. therefore, the warning will be allowed to expire. a tornado watch remains in effect until 600 pm est for southeastern georgia. 12/2/2018 3:20 PM EST At 320 pm est, a severe thunderstorm was located over kingsland, moving east at 40 mph. this storm is showing rotation aloft. tornadoes can develop rapidly with little advanced warning (radar indicated). Hazards include 60 mph wind gusts and quarter size hail. Hail damage to vehicles is expected. Expect wind damage to roofs, siding, and trees. 12/2/2018 3:00 PM EST At 300 pm est, a severe thunderstorm capable of producing a tornado was located near kings ferry, or near kingsland, moving east at 40 mph (radar indicated rotation). Hazards include tornado and golf ball size hail. Flying debris will be dangerous to those caught without shelter. mobile homes will be damaged or destroyed. damage to roofs, windows, and vehicles will occur. tree damage is likely. this dangerous storm will be near, kingsland around 310 pm est. st. marys and kings bay base around 320 pm est. 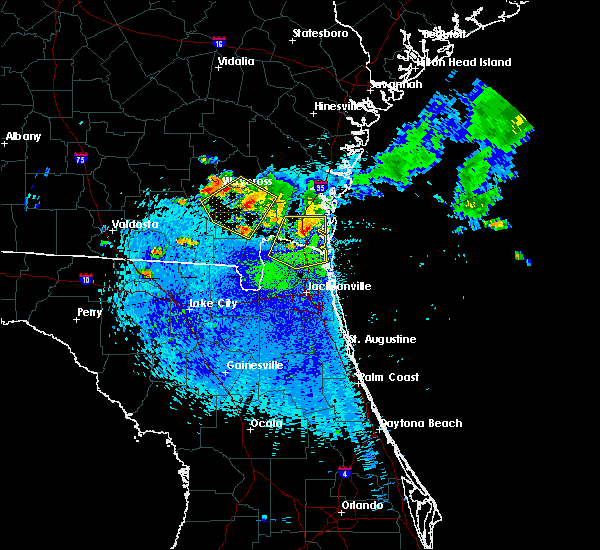 Other locations impacted by this tornadic thunderstorm include cumberland island and harrietts bluff. 12/2/2018 12:05 AM EST At 1205 am est, severe thunderstorms were located along a line extending from 19 miles southeast of blackbeard island to 15 miles east of sea island to near woodbine, moving east at 45 mph (radar indicated). Hazards include 60 mph wind gusts. Expect damage to roofs, siding, and trees. Locations impacted include, kingsland, kings bay base, jekyll island, cumberland island, harrietts bluff and dover bluff. 10/10/2018 5:20 PM EDT At 520 pm edt, severe thunderstorms were located along a line extending from 9 miles east of fernandina beach to near st. marys to near yulee, moving north at 40 mph (radar indicated). Hazards include 60 mph wind gusts. Expect damage to roofs, siding, and trees. locations impacted include, st. marys, kingsland, fernandina beach, kings bay base, yulee and cumberland island. 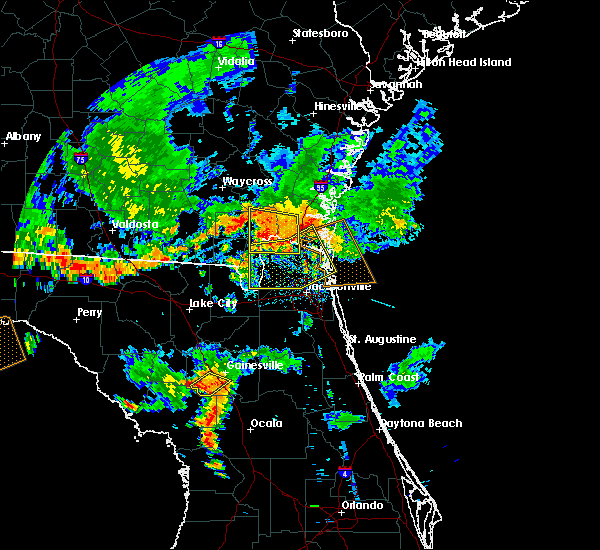 A tornado watch remains in effect until 200 am edt for northeastern florida, and southeastern georgia. 7/16/2018 6:41 PM EDT The severe thunderstorm warning for southeastern camden and southeastern glynn counties will expire at 645 pm edt. the storm which prompted the warning has weakened below severe limits, and no longer poses an immediate threat to life or property. therefore, the warning will be allowed to expire. However gusty winds are still possible with this thunderstorm. 7/16/2018 6:15 PM EDT At 615 pm edt, a severe thunderstorm was located near kings bay base, moving northeast at 15 mph (radar indicated). Hazards include 60 mph wind gusts. Expect damage to roofs, siding, and trees. locations impacted include, st. Marys, kingsland, kings bay base, cumberland island, harrietts bluff and dover bluff. 7/16/2018 5:57 PM EDT The national weather service in jacksonville has issued a * severe thunderstorm warning for. southeastern camden county in southeastern georgia. southeastern glynn county in southeastern georgia. until 645 pm edt. 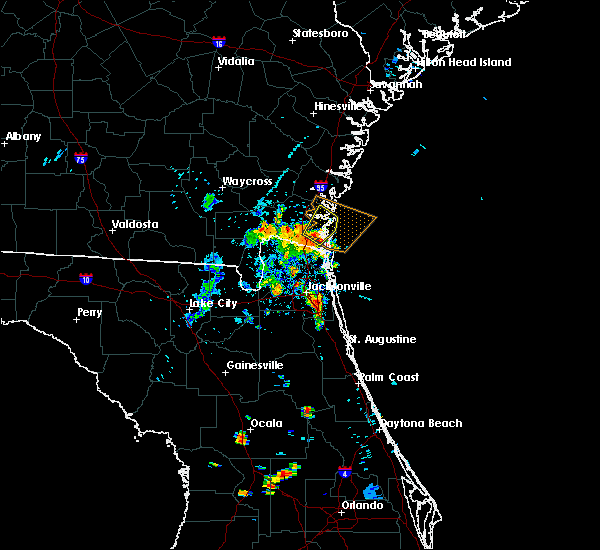 At 557 pm edt, a severe thunderstorm was located near kings bay. 6/28/2018 7:55 PM EDT The severe thunderstorm warning for nassau, northern duval, south central camden and southeastern charlton counties will expire at 800 pm edt, the storms which prompted the warning have weakened below severe limits, and no longer pose an immediate threat to life or property. therefore, the warning will be allowed to expire. 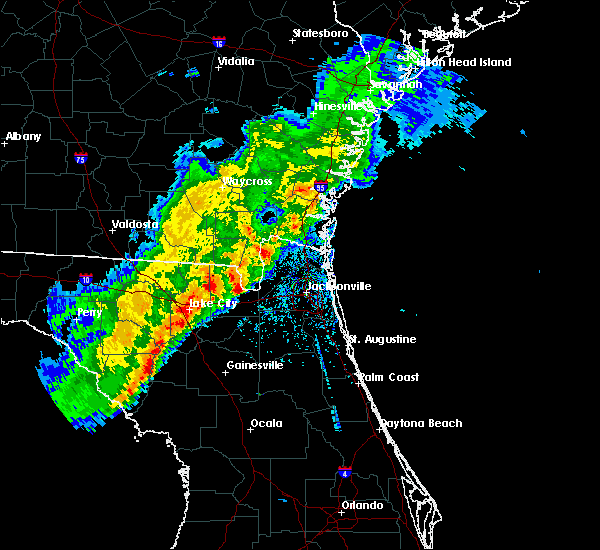 however gusty winds and heavy rain are still possible with these thunderstorms. 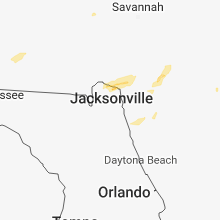 6/28/2018 7:27 PM EDT At 727 pm edt, severe thunderstorms were located along a line extending from near kings bay base to 7 miles north of jacksonville international arpt to 7 miles southwest of hilliard, moving southeast at 40 mph (radar indicated). Hazards include 60 mph wind gusts. Expect damage to roofs, siding, and trees. locations impacted include, st. marys, kingsland, hilliard, callahan, jacksonville international arpt, yulee, cisco gardens, st. George, bryceville and nassau village-ratliff. 6/28/2018 7:11 PM EDT The national weather service in jacksonville has issued a * severe thunderstorm warning for. nassau county in northeastern florida. 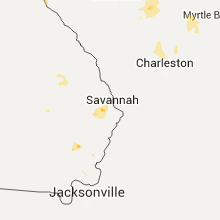 northern duval county in northeastern florida. south central camden county in southeastern georgia. Southeastern charlton county in southeastern georgia. 6/2/2018 5:50 PM EDT At 549 pm edt, severe thunderstorms were located along a line extending from 9 miles northeast of kings bay base to near oceanway to near ratliff, moving southeast at 25 mph (radar indicated). Hazards include 60 mph wind gusts and penny size hail. Expect damage to roofs, siding, and trees. locations impacted include, st. Marys, fernandina beach, callahan, kings bay base, jacksonville international arpt, yulee, nassau village-ratliff, ratliff, oceanway and cumberland island. 6/2/2018 5:38 PM EDT At 538 pm edt, severe thunderstorms were located along a line extending from near waverly to 8 miles southeast of kings ferry to st. george, moving southeast at 35 mph (radar indicated). Hazards include 60 mph wind gusts and penny size hail. Expect damage to roofs, siding, and trees. locations impacted include, st. Marys, kingsland, fernandina beach, callahan, jacksonville international arpt, kings bay base, yulee, cisco gardens, bryceville and nassau village-ratliff. 4/15/2018 3:30 PM EDT At 329 pm edt, a severe thunderstorm was located 9 miles east of woodbine, moving northeast at 50 mph (radar indicated). Hazards include 60 mph wind gusts and penny size hail. Expect damage to roofs, siding, and trees. locations impacted include, st. marys, kingsland, kings bay base, cumberland island and harrietts bluff. 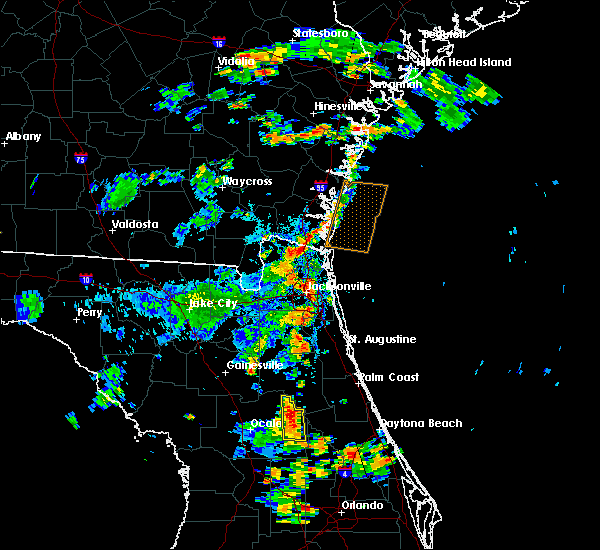 A tornado watch remains in effect until 600 pm edt for northeastern florida, and southeastern georgia. 4/15/2018 2:54 PM EDT At 253 pm edt, a severe thunderstorm capable of producing a tornado was located near kingsland, moving northeast at 50 mph (radar indicated rotation). Hazards include tornado. Flying debris will be dangerous to those caught without shelter. mobile homes will be damaged or destroyed. damage to roofs, windows, and vehicles will occur. tree damage is likely. 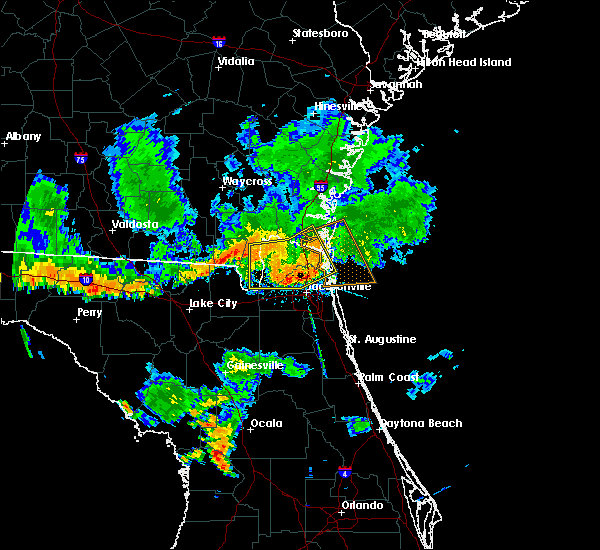 this dangerous storm will be near, jekyll island around 310 pm edt. brunswick, dock junction, sea island and country club estates around 320 pm edt. 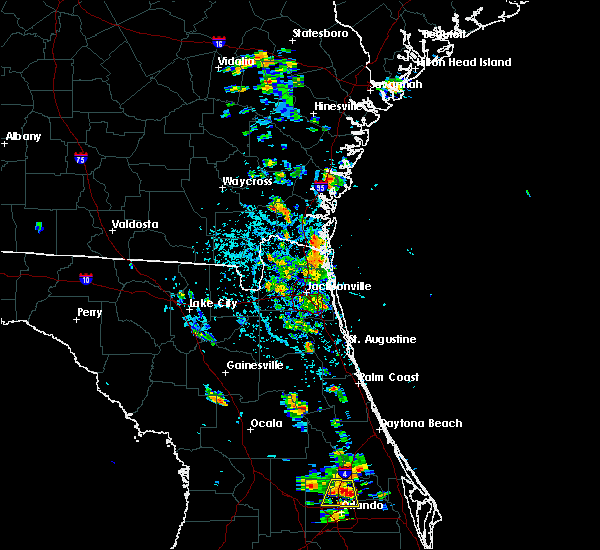 st. simons island around 325 pm edt. Other locations impacted by this tornadic thunderstorm include dover bluff, boys estate and harrietts bluff. 4/15/2018 2:42 PM EDT At 242 pm edt, a severe thunderstorm was located near kingsland, moving northeast at 50 mph (radar indicated). Hazards include 60 mph wind gusts. Expect damage to roofs, siding, and trees. locations impacted include, kingsland, woodbine, harrietts bluff, dover bluff and colesburg. 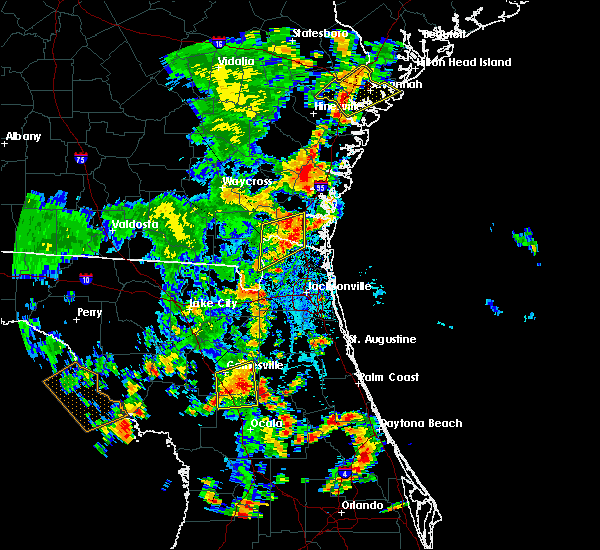 A tornado watch remains in effect until 600 pm edt for northeastern florida, and southeastern georgia. 9/11/2017 5:18 AM EDT At 518 am edt, a severe thunderstorm capable of producing a tornado was located near kings bay base, moving west at 65 mph (radar indicated rotation). Hazards include tornado. Flying debris will be dangerous to those caught without shelter. mobile homes will be damaged or destroyed. damage to roofs, windows, and vehicles will occur. tree damage is likely. This dangerous storm will be near, kingsland around 530 am edt. 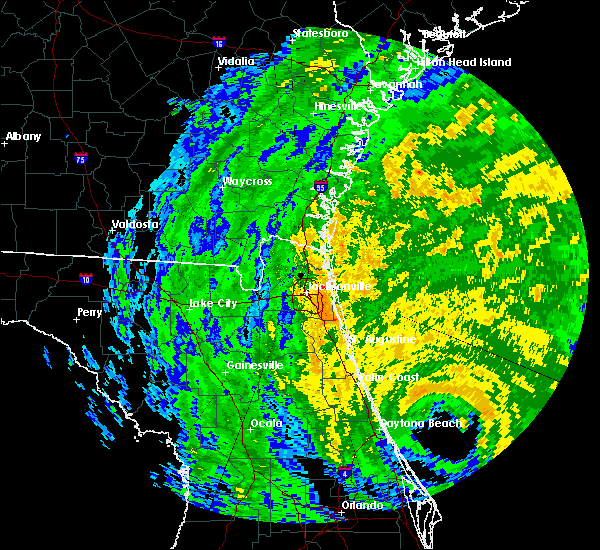 9/11/2017 2:02 AM EDT At 200 am edt, a severe thunderstorm capable of producing a tornado was located 21 miles east of fernandina beach, moving west at 70 mph (radar indicated rotation). Hazards include tornado. Flying debris will be dangerous to those caught without shelter. mobile homes will be damaged or destroyed. damage to roofs, windows, and vehicles will occur. tree damage is likely. 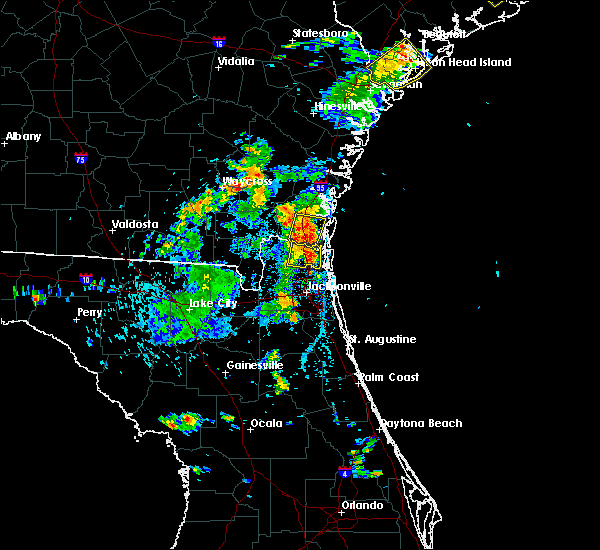 this dangerous storm will be near, fernandina beach around 220 am edt. 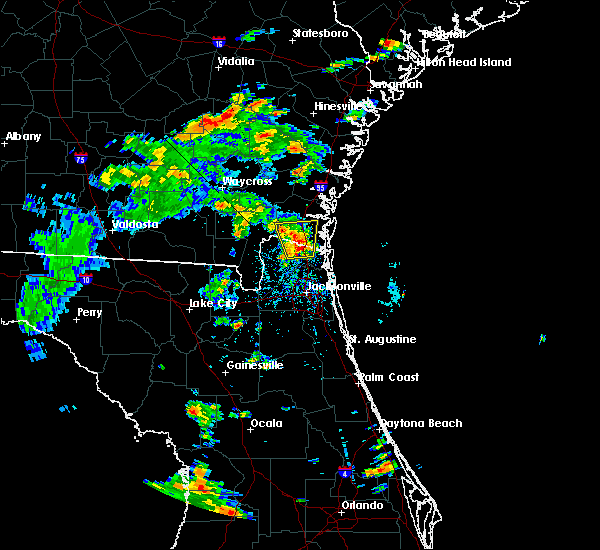 yulee around 225 am edt. st. Marys, kingsland and kings bay base around 230 am edt. 7/29/2017 4:07 PM EDT At 406 pm edt, severe thunderstorms were located along a line extending from near country club estates to 6 miles northeast of kingsland, moving east at 20 mph (radar indicated). Hazards include 60 mph wind gusts. Expect damage to roofs, siding, and trees. locations impacted include, st. marys, kingsland, brunswick, st. Simons island, dock junction, kings bay base, country club estates, sea island, jekyll island and harrietts bluff. 7/29/2017 3:54 PM EDT At 354 pm edt, severe thunderstorms were located along a line extending from 6 miles north of dock junction to near kingsland, moving east at 30 mph (radar indicated). Hazards include 60 mph wind gusts. Expect damage to roofs, siding, and trees. locations impacted include, st. marys, kingsland, brunswick, st. Simons island, woodbine, dock junction, kings bay base, country club estates, sea island and jekyll island. 7/17/2017 4:41 PM EDT The severe thunderstorm warning for southeastern camden county will expire at 445 pm edt, the storm which prompted the warning has weakened below severe limits, and has exited the warned area. therefore, the warning will be allowed to expire. however heavy rain is still possible with this thunderstorm. 7/17/2017 4:29 PM EDT At 428 pm edt, a severe thunderstorm was located near kingsland, moving north at 30 mph (radar indicated). Hazards include 60 mph wind gusts. Expect damage to roofs, siding, and trees. Locations impacted include, kingsland, kings bay base, cumberland island, harrietts bluff and colesburg. 7/17/2017 4:06 PM EDT The national weather service in jacksonville has issued a * severe thunderstorm warning for. northeastern nassau county in northeastern florida. southern camden county in southeastern georgia. 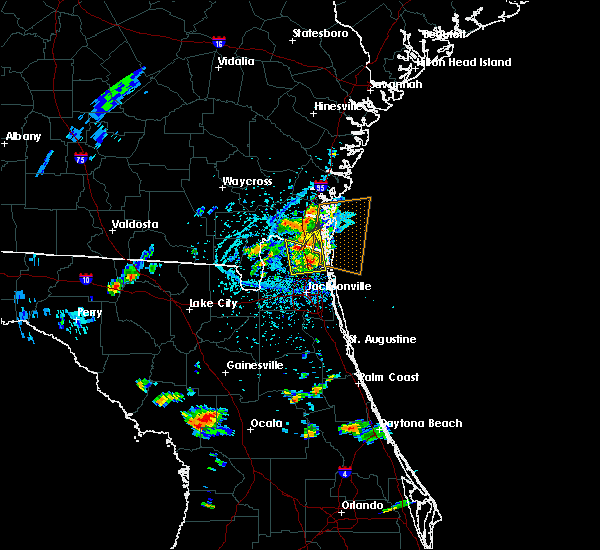 Until 445 pm edt * at 406 pm edt, a severe thunderstorm was located near kingsland,. 6/17/2017 6:29 PM EDT At 629 pm edt, a severe thunderstorm was located 7 miles north of kingsland, moving southeast at 15 mph (radar indicated). Hazards include 60 mph wind gusts and penny size hail. Expect damage to roofs, siding, and trees. Locations impacted include, kingsland, brunswick, woodbine, kings bay base, kings ferry, harrietts bluff, dover bluff and colesburg. 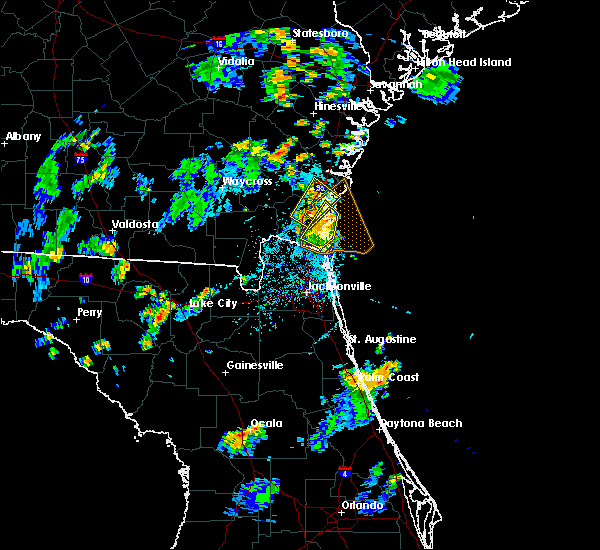 5/30/2017 3:43 PM EDT At 342 pm edt, a severe thunderstorm was located near yulee, or 7 miles north of jacksonville international arpt, moving east at 10 mph (radar indicated). Hazards include 60 mph wind gusts and quarter size hail. Hail damage to vehicles is expected. expect wind damage to roofs, siding, and trees. locations impacted include, st. Marys, kingsland and yulee. 5/30/2017 3:20 PM EDT At 320 pm edt, a severe thunderstorm was located near callahan, moving east at 10 mph (radar indicated). Hazards include 60 mph wind gusts and quarter size hail. Hail damage to vehicles is expected. Expect wind damage to roofs, siding, and trees. 5/30/2017 3:01 PM EDT At 301 pm edt, a severe thunderstorm was located over kingsland, moving south at 10 mph (public). Hazards include 60 mph wind gusts and half dollar size hail. Hail damage to vehicles is expected. expect wind damage to roofs, siding, and trees. locations impacted include, st. Marys, kingsland, kings bay base, yulee and harrietts bluff. 5/30/2017 2:52 PM EDT At 252 pm edt, a severe thunderstorm was located over kingsland, moving south at 10 mph (radar indicated). Hazards include 60 mph wind gusts and quarter size hail. Hail damage to vehicles is expected. Expect wind damage to roofs, siding, and trees. 5/23/2017 5:06 PM EDT At 506 pm edt, a severe thunderstorm was located over kings bay base, moving northeast at 35 mph (radar indicated). Hazards include 60 mph wind gusts and quarter size hail. Hail damage to vehicles is expected. expect wind damage to roofs, siding, and trees. locations impacted include, st. marys, kings bay base and cumberland island. 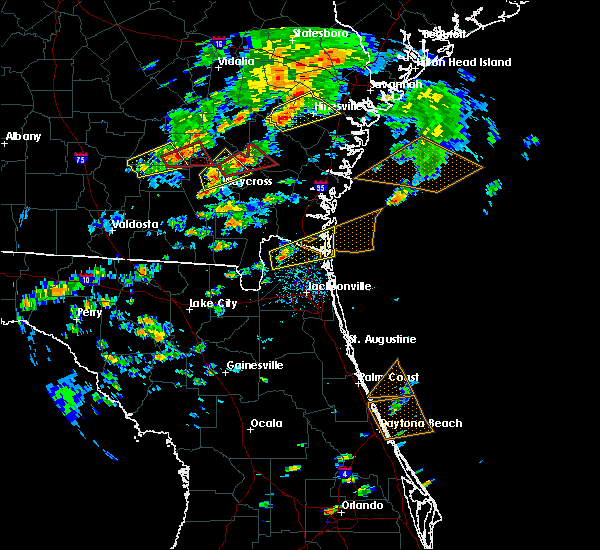 A tornado watch remains in effect until 1100 pm edt for southeastern georgia. 5/23/2017 4:49 PM EDT At 449 pm edt, a severe thunderstorm was located 7 miles south of kingsland, moving northeast at 45 mph (radar indicated). Hazards include 60 mph wind gusts and quarter size hail. Hail damage to vehicles is expected. expect wind damage to roofs, siding, and trees. locations impacted include, st. marys, kingsland, kings bay base and cumberland island. 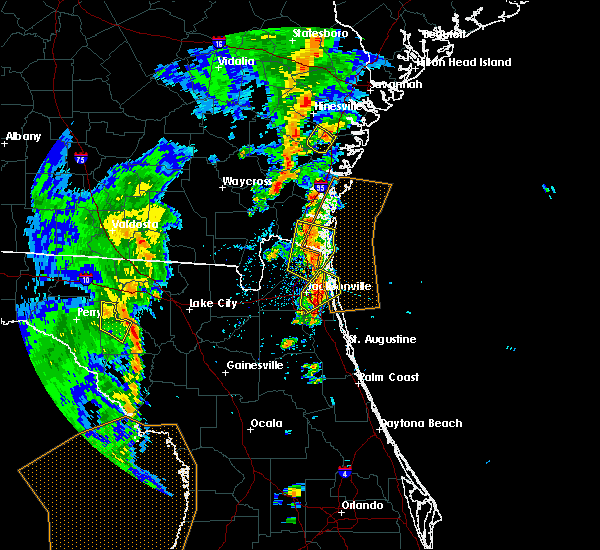 A tornado watch remains in effect until 1100 pm edt for southeastern georgia. 5/23/2017 4:29 PM EDT At 429 pm edt, a severe thunderstorm was located near callahan, moving northeast at 35 mph (radar indicated). Hazards include 60 mph wind gusts and quarter size hail. Hail damage to vehicles is expected. Expect wind damage to roofs, siding, and trees. 5/22/2017 4:04 PM EDT At 404 pm edt, a severe thunderstorm was located near kings bay base, moving northeast at 10 mph (radar indicated). Hazards include 60 mph wind gusts and quarter size hail. Hail damage to vehicles is expected. expect wind damage to roofs, siding, and trees. Locations impacted include, kings bay base, cumberland island and harrietts bluff. 5/22/2017 3:55 PM EDT The tornado warning for southeastern camden county will expire at 400 pm edt, the tornado threat has diminished and the tornado warning has been cancelled. however, large hail and damaging winds remain likely and a severe thunderstorm warning remains in effect for the area. hail, gusty winds and heavy rain are still expected with this thunderstorm. to report severe weather, contact your nearest law enforcement agency. they will relay your report to the national weather service jacksonville. 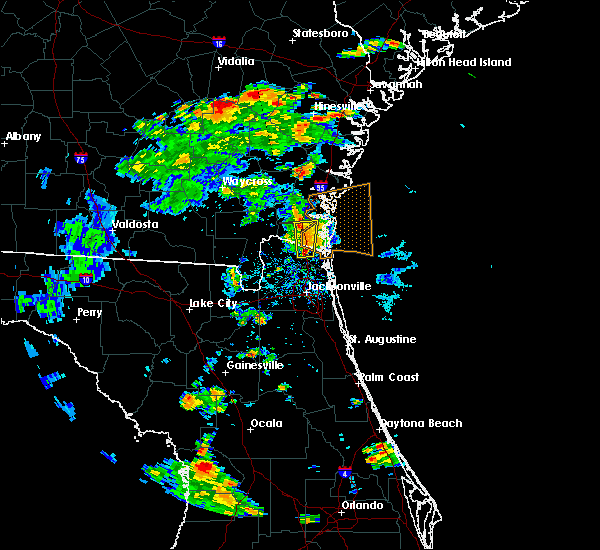 remember, a severe thunderstorm warning still remains in effect for coastal camden county through 4:30 pm edt. 5/22/2017 3:48 PM EDT At 348 pm edt, a severe thunderstorm was located over kingsland, moving east at 5 mph (radar indicated). Hazards include 60 mph wind gusts and quarter size hail. Hail damage to vehicles is expected. Expect wind damage to roofs, siding, and trees. 5/22/2017 3:42 PM EDT At 341 pm edt, a severe thunderstorm capable of producing a tornado was located near kings bay base, moving east at 10 mph (weather spotters reported a funnel cloud). Hazards include tornado and quarter size hail. Flying debris will be dangerous to those caught without shelter. mobile homes will be damaged or destroyed. damage to roofs, windows, and vehicles will occur. tree damage is likely. Locations impacted include, kings bay base, cumberland island and harrietts bluff. 5/22/2017 3:26 PM EDT At 326 pm edt, a severe thunderstorm capable of producing a tornado was located 7 miles north of kings bay base, moving east at 20 mph (weather spotters reported funnel cloud). Hazards include tornado. Flying debris will be dangerous to those caught without shelter. mobile homes will be damaged or destroyed. damage to roofs, windows, and vehicles will occur. tree damage is likely. This tornadic thunderstorm will remain over mainly rural areas of southeastern camden county, including the following locations: cumberland island and harrietts bluff. 5/13/2017 4:36 PM EDT The severe thunderstorm warning for nassau, northern duval and southern camden counties will expire at 445 pm edt, the storm which prompted the warning has weakened below severe limits, and no longer poses an immediate threat to life or property. therefore the warning will be allowed to expire. however small hail, gusty winds and heavy rain are still possible with this thunderstorm. to report severe weather, contact your nearest law enforcement agency. 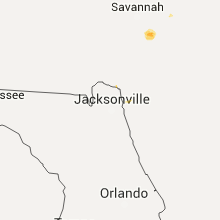 they will relay your report to the national weather service jacksonville. 5/13/2017 3:47 PM EDT At 347 pm edt, a severe thunderstorm was located over st. george, or 12 miles west of callahan, moving east at 45 mph (radar indicated). Hazards include 70 mph wind gusts and quarter size hail. Hail damage to vehicles is expected. expect considerable tree damage. Wind damage is also likely to mobile homes, roofs, and outbuildings. 5/4/2017 4:35 PM EDT At 435 pm edt, a severe thunderstorm was located near yulee, or 9 miles southwest of st. marys, moving northeast at 30 mph (radar indicated). Hazards include 60 mph wind gusts and penny size hail. Expect damage to roofs, siding, and trees. locations impacted include, st. Marys, kingsland, fernandina beach, kings bay base, yulee and harrietts bluff. 4/6/2017 2:17 AM EDT At 216 am edt, a severe thunderstorm capable of producing a tornado was located over st. marys, moving east at 40 mph (radar indicated rotation). Hazards include tornado. Flying debris will be dangerous to those caught without shelter. mobile homes will be damaged or destroyed. damage to roofs, windows, and vehicles will occur. tree damage is likely. 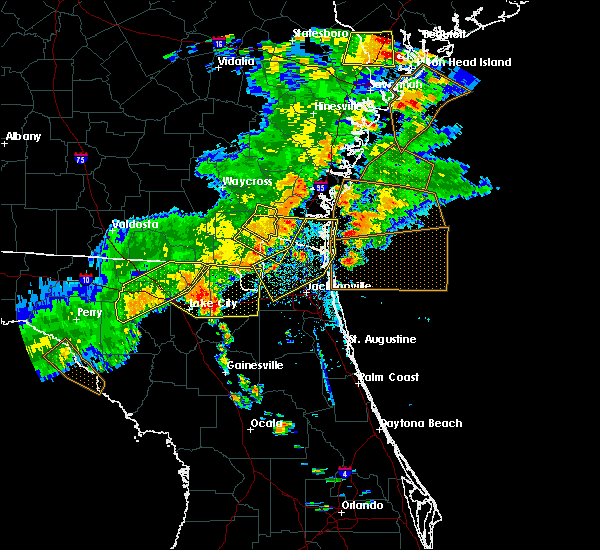 this dangerous storm will be near, fernandina beach around 225 am edt. dungeness around 225 am edt. 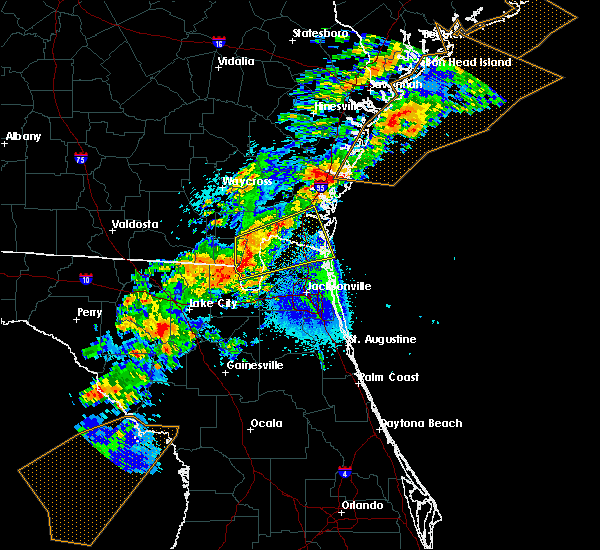 Other locations impacted by this tornadic thunderstorm include cumberland island. 4/6/2017 2:10 AM EDT At 210 am edt, a severe thunderstorm capable of producing a tornado was located near st. marys, moving northeast at 45 mph (radar indicated rotation). Hazards include tornado. Flying debris will be dangerous to those caught without shelter. mobile homes will be damaged or destroyed. damage to roofs, windows, and vehicles will occur. tree damage is likely. 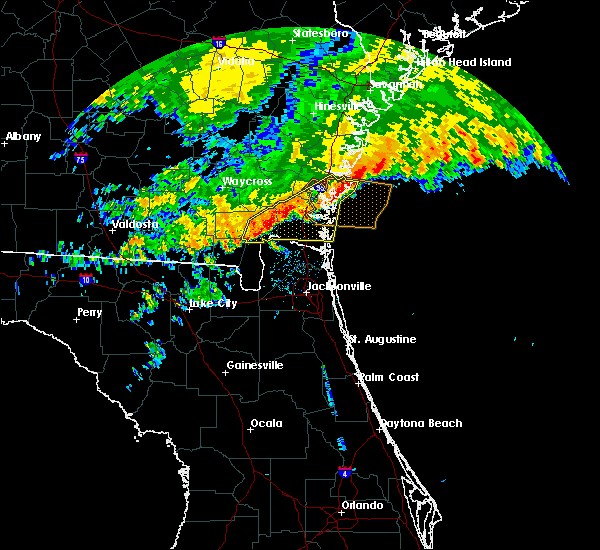 this dangerous storm will be near, kings bay base around 215 am edt. 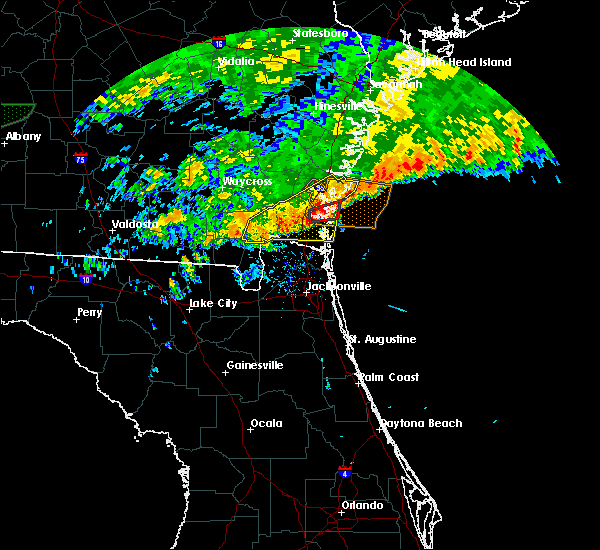 fernandina beach around 220 am edt. 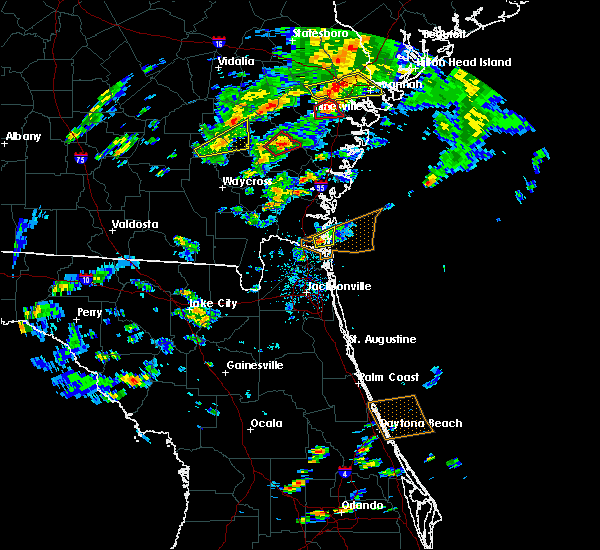 Other locations impacted by this tornadic thunderstorm include cumberland island. 4/6/2017 1:29 AM EDT At 129 am edt, a severe thunderstorm was located 8 miles northwest of st. george, or 11 miles southwest of hilliard, moving east at 55 mph (radar indicated). Hazards include 60 mph wind gusts and quarter size hail. Hail damage to vehicles is expected. Expect wind damage to roofs, siding, and trees. 2/7/2017 10:18 PM EST At 1018 pm est, a severe thunderstorm was located 7 miles west of yulee, or 8 miles northeast of callahan, moving northeast at 50 mph (radar indicated). Hazards include 60 mph wind gusts. Expect damage to roofs, siding, and trees. locations impacted include, st. Marys, kingsland, fernandina beach, kings bay base, yulee, kings ferry, cumberland island and harrietts bluff. 1/22/2017 7:15 PM EST At 714 pm est, severe thunderstorms were located along a line extending from 6 miles northeast of kings bay base to near bostwick, moving northeast at 95 mph (radar indicated). Hazards include 60 mph wind gusts and quarter size hail. Hail damage to vehicles is expected. Expect wind damage to roofs, siding, and trees. 1/22/2017 7:00 PM EST At 700 pm est, a severe thunderstorm was located 10 miles northeast of kings bay base, moving northeast at 80 mph (radar indicated). Hazards include 60 mph wind gusts and quarter size hail. Hail damage to vehicles is expected. expect wind damage to roofs, siding, and trees. locations impacted include, st. marys, kingsland, fernandina beach, callahan, kings bay base, yulee and cumberland island. 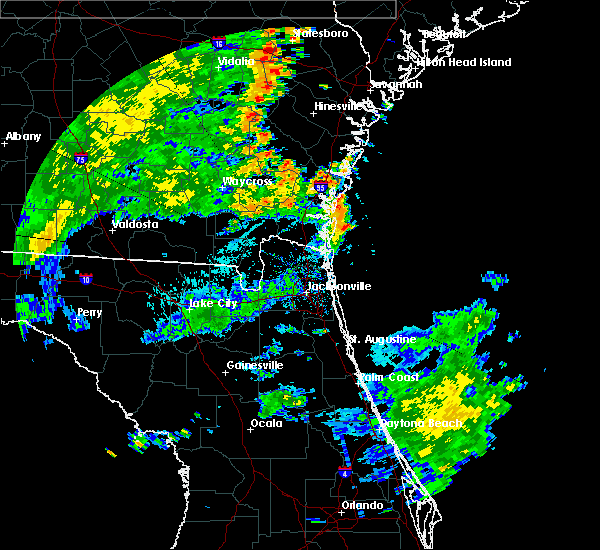 A tornado watch remains in effect until 800 pm est for northeastern florida, and southeastern georgia. 1/22/2017 6:44 PM EST At 643 pm est, a severe thunderstorm was located near kingsland, moving northeast at 80 mph (radar indicated). Hazards include 60 mph wind gusts and quarter size hail. Hail damage to vehicles is expected. expect wind damage to roofs, siding, and trees. locations impacted include, st. marys, kingsland, fernandina beach, hilliard, callahan, kings bay base, yulee, cumberland island and harrietts bluff. 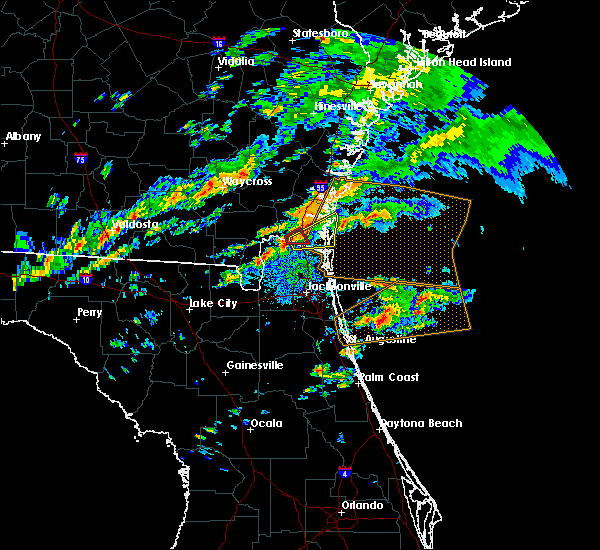 A tornado watch remains in effect until 800 pm est for northeastern florida, and southeastern georgia. 1/22/2017 6:27 PM EST At 626 pm est, a severe thunderstorm was located over st. george, or 12 miles west of callahan, moving northeast at 80 mph (radar indicated). Hazards include 60 mph wind gusts and quarter size hail. Hail damage to vehicles is expected. Expect wind damage to roofs, siding, and trees. 1/22/2017 6:14 PM EST At 614 pm est, severe thunderstorms were located along a line extending from near waynesville to 6 miles north of st. george, moving northeast at 85 mph (radar indicated). Hazards include 60 mph wind gusts and quarter size hail. Hail damage to vehicles is expected. expect wind damage to roofs, siding, and trees. locations impacted include, st. marys, kingsland, brunswick, st. simons island, hilliard, folkston, woodbine, callahan, dock junction and kings bay base. 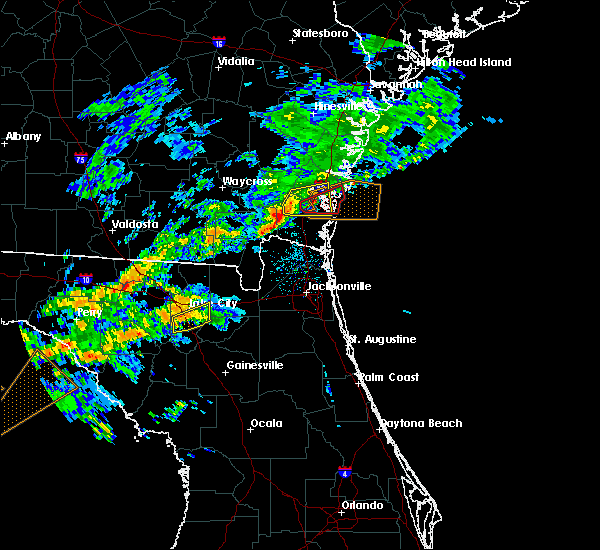 A tornado watch remains in effect until 800 pm est for northern and northeastern florida, and southeastern georgia. 1/22/2017 6:10 PM EST At 609 pm est, severe thunderstorms were located along a line extending from near nahunta to near st. george, moving northeast at 85 mph (radar indicated). Hazards include 60 mph wind gusts and quarter size hail. Hail damage to vehicles is expected. expect wind damage to roofs, siding, and trees. locations impacted include, st. marys, kingsland, brunswick, st. simons island, hilliard, folkston, woodbine, callahan, dock junction and kings bay base. 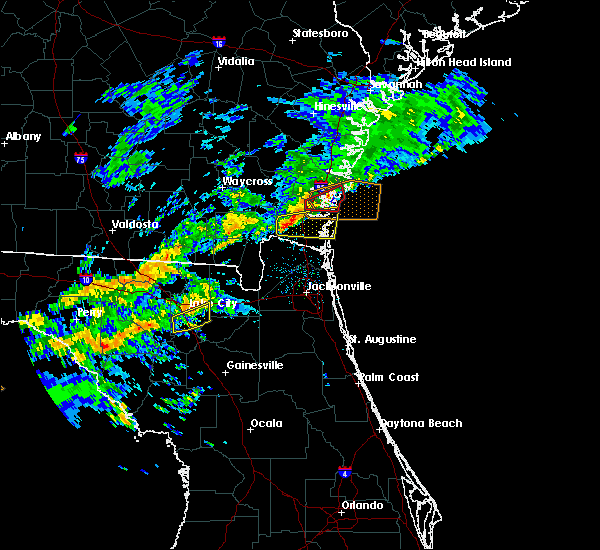 A tornado watch remains in effect until 800 pm est for northern and northeastern florida, and southeastern georgia. 1/22/2017 5:50 PM EST At 550 pm est, severe thunderstorms were located along a line extending from 8 miles west of race pond to 6 miles northwest of olustee, moving northeast at 85 mph (radar indicated). Hazards include 60 mph wind gusts and quarter size hail. Hail damage to vehicles is expected. Expect wind damage to roofs, siding, and trees. 1/22/2017 10:26 AM EST At 1026 am est, severe thunderstorms were located along a line extending from near st. simons island to kingsland to near hilliard, moving east at 70 mph (radar indicated). Hazards include 60 mph wind gusts. Expect damage to roofs, siding, and trees. locations impacted include, st. marys, kingsland, brunswick, st. simons island, fernandina beach, hilliard, folkston, woodbine, dock junction and kings bay base. 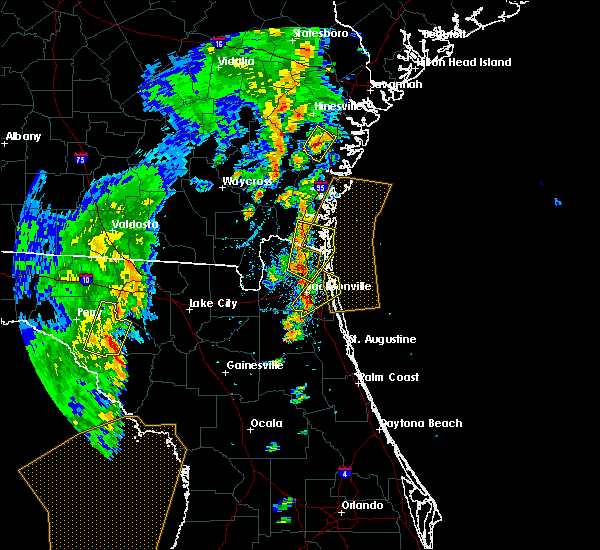 A tornado watch remains in effect until 1100 am est for northeastern florida, and southeastern georgia. 10/7/2016 10:53 AM EDT The tornado warning for northern nassau and southeastern camden counties will expire at 1100 am edt, the storm which prompted the warning has weakened below severe limits, and no longer appears capable of producing a tornado. therefore the warning will be allowed to expire. however gusty winds are still possible with this thunderstorm. 10/7/2016 10:36 AM EDT At 1036 am edt, a severe thunderstorm capable of producing a tornado was located 8 miles east of kings bay base, moving southwest at 60 mph (radar indicated rotation). Hazards include tornado. Flying debris will be dangerous to those caught without shelter. mobile homes will be damaged or destroyed. damage to roofs, windows, and vehicles will occur. tree damage is likely. 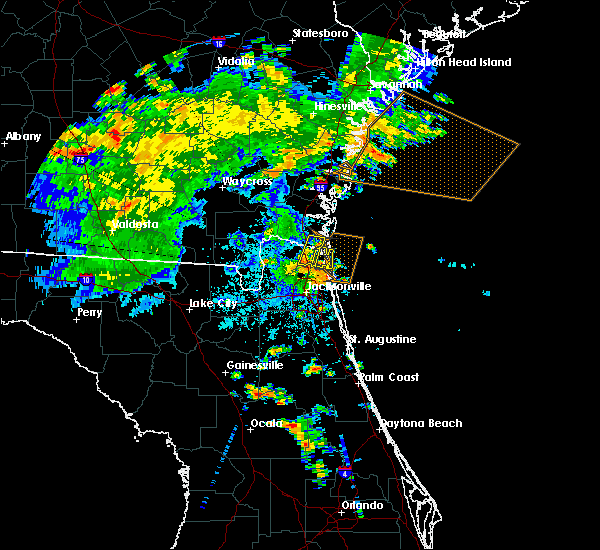 this dangerous storm will be near, fernandina beach and kings bay base around 1045 am edt. 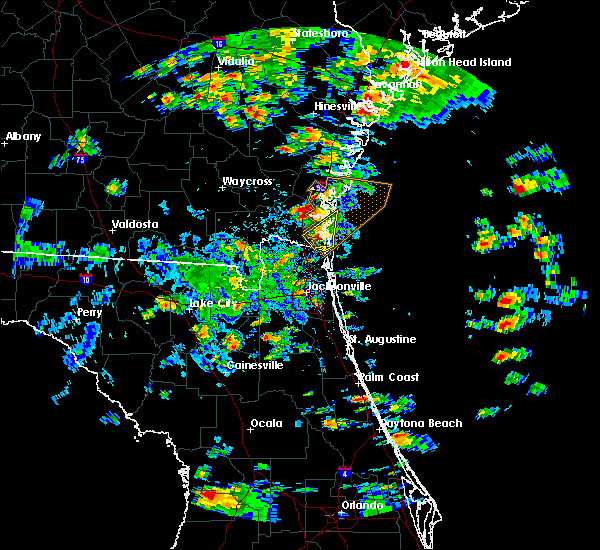 st. marys and yulee around 1050 am edt. 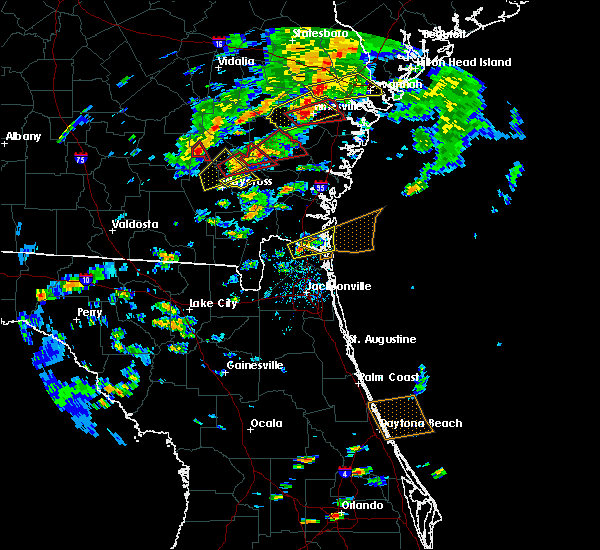 Other locations impacted by this tornadic thunderstorm include cumberland island. 8/4/2016 1:57 PM EDT At 157 pm edt, a severe thunderstorm capable of producing a tornado was located over yulee, or near st. marys, moving north at 15 mph (radar indicated rotation). Hazards include tornado. Flying debris will be dangerous to those caught without shelter. mobile homes will be damaged or destroyed. damage to roofs, windows, and vehicles will occur. tree damage is likely. 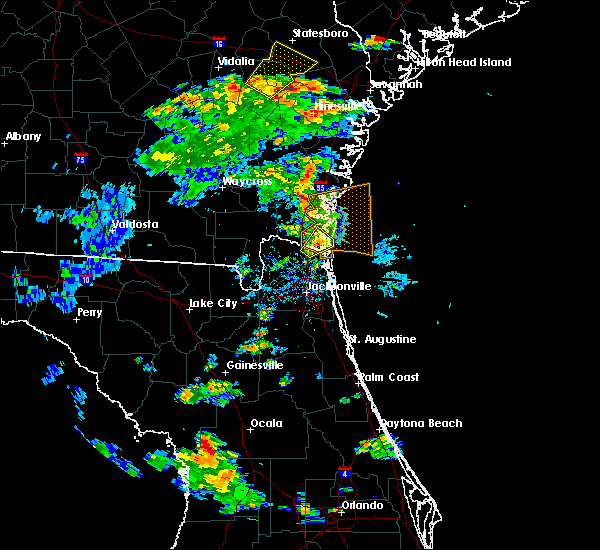 this dangerous storm will be near, fernandina beach around 225 pm edt. st. Marys and kings bay base around 230 pm edt. 7/14/2016 3:56 PM EDT At 355 pm edt, a severe thunderstorm was located over kingsland, moving northeast at 5 mph (radar indicated). Hazards include 60 mph wind gusts and quarter size hail. Hail damage to vehicles is expected. Expect wind damage to roofs, siding, and trees. 7/11/2016 8:26 PM EDT The severe thunderstorm warning for eastern camden county will expire at 830 pm edt, the storm which prompted the warning has weakened below severe limits, and no longer pose an immediate threat to life or property. therefore, the warning will be allowed to expire. however gusty winds are still possible with this thunderstorm. to report severe weather, contact your nearest law enforcement agency. 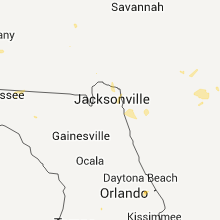 they will relay your report to the national weather service jacksonville. 7/11/2016 8:18 PM EDT At 818 pm edt, a severe thunderstorm was located near kings bay base, moving northeast at 15 mph (radar indicated). Hazards include 60 to 70 mph wind gusts. Expect considerable tree damage. damage is likely to mobile homes, roofs, and outbuildings. locations impacted include, st. Marys, kingsland, kings bay base, dover bluff, cumberland island and harrietts bluff. 7/11/2016 8:10 PM EDT At 810 pm edt, a severe thunderstorm was located near kings bay base, moving northeast at 20 mph (radar indicated). Hazards include 60 mph wind gusts. Expect damage to roofs. siding. and trees. locations impacted include, st. Marys, kingsland, kings bay base, dover bluff, cumberland island and harrietts bluff. 7/11/2016 8:03 PM EDT At 803 pm edt, a severe thunderstorm was located near kingsland, moving northeast at 15 mph (radar indicated). Hazards include 60 mph wind gusts. Expect damage to roofs. siding. And trees. 6/5/2016 4:11 PM EDT At 411 pm edt, a severe thunderstorm was located near yulee, or near st. marys, moving northeast at 15 mph (radar indicated). Hazards include 60 mph wind gusts. Expect damage to roofs. siding. And trees. 6/5/2016 3:54 PM EDT At 354 pm edt, severe thunderstorms were located along a line extending from woodbine to 6 miles west of yulee, moving northeast at 15 mph (radar indicated). Hazards include 60 mph wind gusts. Expect damage to roofs. siding. and trees. locations impacted include, st. Marys, kingsland, kings bay base, yulee, colesburg and harrietts bluff. 6/5/2016 3:29 PM EDT At 329 pm edt, a severe thunderstorm was located 7 miles southwest of kingsland, moving north at 15 mph (radar indicated). Hazards include 60 mph wind gusts. Expect damage to roofs. siding. And trees. 5/17/2016 2:15 PM EDT At 215 pm edt, a severe thunderstorm was located over st. marys, moving northeast at 20 mph (radar indicated). Hazards include 60 mph wind gusts and quarter size hail. Hail damage to vehicles is expected. Expect wind damage to roofs, siding, and trees. 4/1/2016 5:30 PM EDT At 530 pm edt, a severe thunderstorm was located over kings bay base, moving northeast at 35 mph (radar indicated). Hazards include 60 mph wind gusts and quarter size hail. Hail damage to vehicles is expected. expect wind damage to roofs, siding, and trees. locations impacted include, st. marys, fernandina beach, kings bay base, yulee and cumberland island. 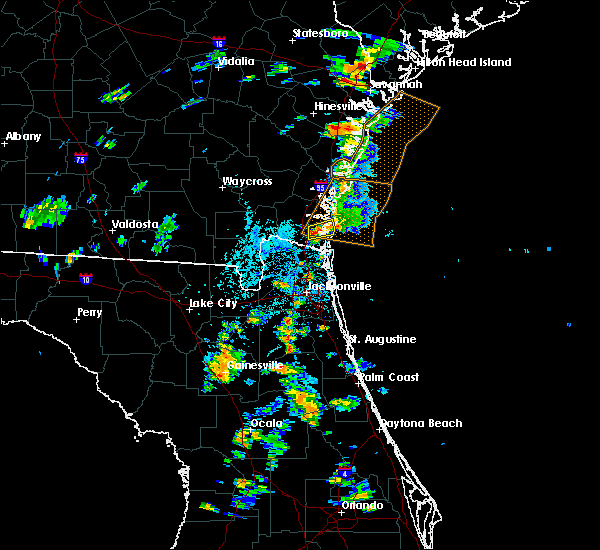 A tornado watch remains in effect until 900 pm edt for northeastern florida, and southeastern georgia. 4/1/2016 5:11 PM EDT At 511 pm edt, a severe thunderstorm was located near yulee, or 7 miles west of st. marys, moving northeast at 35 mph (radar indicated). Hazards include 60 mph wind gusts and quarter size hail. Hail damage to vehicles is expected. Expect wind damage to roofs, siding, and trees. 8/23/2015 5:03 PM EDT At 503 pm edt, doppler radar indicated a severe thunderstorm capable of producing damaging winds in excess of 60 mph. this storm was located over kings ferry, or near hilliard, and moving east at 35 mph. nickel size hail may also accompany the damaging winds. 8/22/2015 9:45 PM EDT At 945 pm edt, doppler radar indicated a severe thunderstorm capable of producing destructive winds in excess of 80 mph. this storm was located near st. marys, moving south at 25 mph. locations impacted include, st. marys, kingsland, hilliard, kings bay base and yulee. 8/22/2015 9:27 PM EDT At 926 pm edt, doppler radar indicated a severe thunderstorm capable of producing quarter size hail and destructive winds in excess of 80 mph. this storm was located over kingsland, moving south at 25 mph. locations impacted include, st. marys, kingsland, hilliard, woodbine, kings bay base, yulee, kings ferry, colesburg and harrietts bluff. 8/22/2015 9:15 PM EDT At 915 pm edt, doppler radar indicated a severe thunderstorm capable of producing quarter size hail and destructive winds in excess of 70 mph. this storm was located near woodbine, and moving south at 25 mph. 8/20/2015 5:42 PM EDT At 542 pm edt, doppler radar indicated a line of severe thunderstorms capable of producing quarter size hail and damaging winds in excess of 60 mph. these storms were located along a line extending from 7 miles south of jekyll island to 7 miles northeast of callahan, and moving east at 25 mph. 7/14/2015 6:09 PM EDT The severe thunderstorm warning for northeastern nassau and southeastern camden counties will expire at 615 pm edt, the storm which prompted the warning has moved out of the area. therefore the warning will be allowed to expire. however gusty winds are still possible with this thunderstorm. 7/14/2015 5:25 PM EDT At 525 pm edt, doppler radar indicated a severe thunderstorm capable of producing quarter size hail and damaging winds in excess of 60 mph. 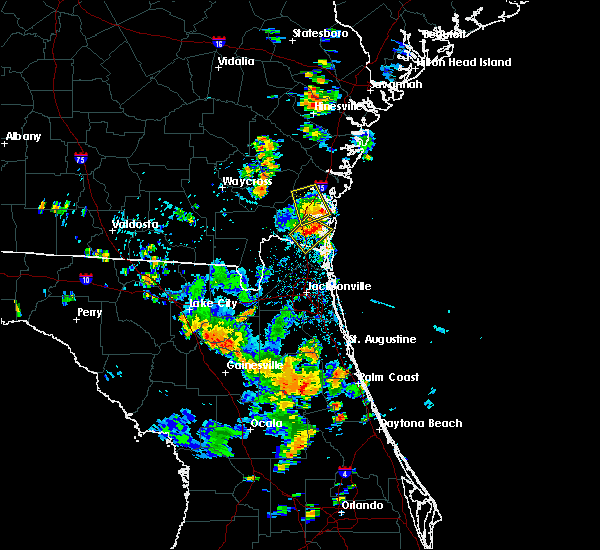 this storm was located near yulee, or near st. marys, and moving northeast at 15 mph. 7/5/2015 4:14 PM EDT At 413 pm edt, doppler radar indicated a severe thunderstorm capable of producing quarter size hail and damaging winds in excess of 60 mph. this storm was located near kingsland, and moving east at 20 mph. 7/2/2015 6:13 PM EDT At 613 pm edt, doppler radar indicated a line of severe thunderstorms capable of producing damaging winds in excess of 60 mph. these storms were located along a line extending from near jesup to near nahunta to race pond, and moving northeast at 35 mph. 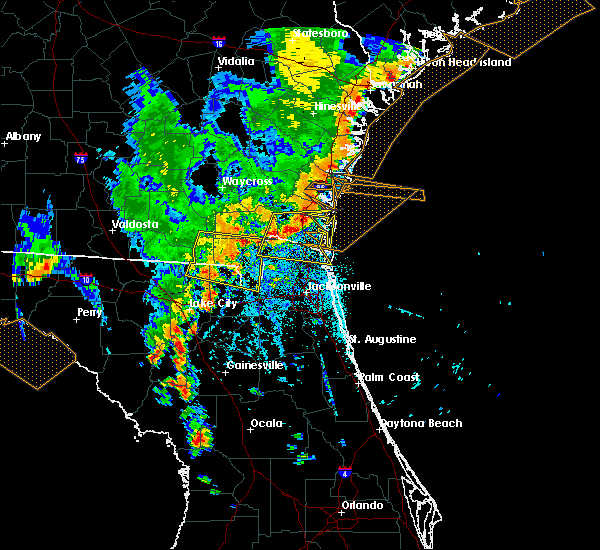 6/28/2015 4:55 PM EDT At 454 pm edt, doppler radar indicated a line of severe thunderstorms capable of producing damaging winds in excess of 60 mph. these storms were located along a line extending from 9 miles southwest of jekyll island to near nassau village-ratliff, moving east at 30 mph. locations impacted include, jacksonville, st. marys, kingsland, fernandina beach, callahan, jacksonville international arpt, kings bay base, yulee, oceanway, ratliff, nassau village-ratliff, cumberland island, harrietts bluff and dover bluff. 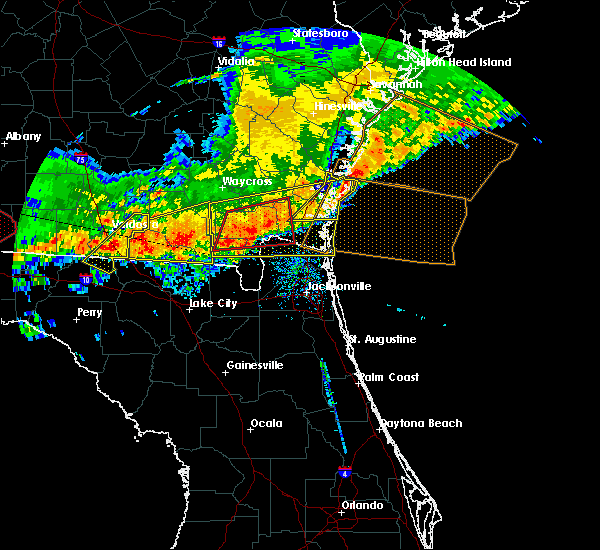 6/28/2015 4:34 PM EDT At 434 pm edt, doppler radar indicated a line of severe thunderstorms capable of producing damaging winds in excess of 60 mph. these storms were located along a line extending from near woodbine to near callahan, and moving east at 25 mph. 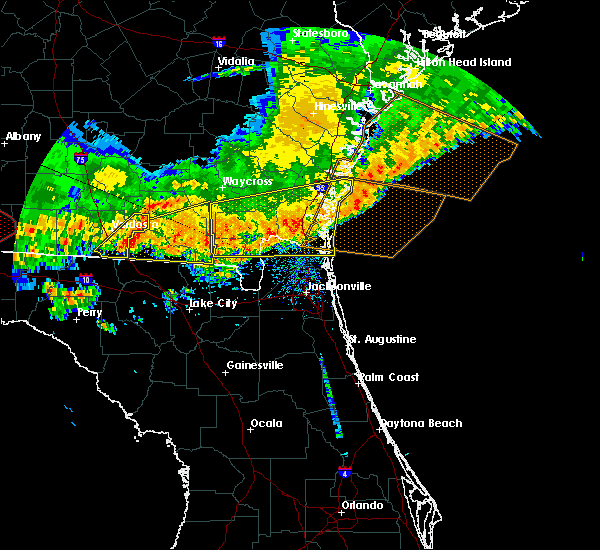 6/22/2015 9:24 PM EDT At 924 pm edt, doppler radar indicated a severe thunderstorm capable of producing damaging winds in excess of 60 mph. this storm was located near st. marys, moving northeast at 20 mph. locations impacted include, st. marys, kingsland, kings bay base and yulee. 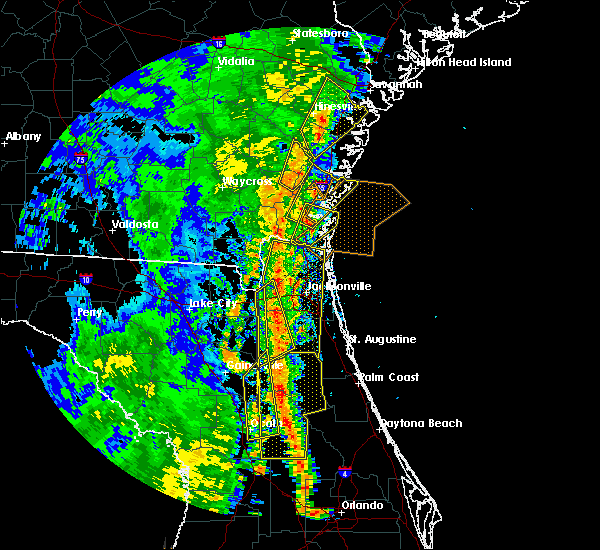 6/22/2015 9:01 PM EDT At 901 pm edt, doppler radar indicated a severe thunderstorm capable of producing destructive winds in excess of 70 mph. 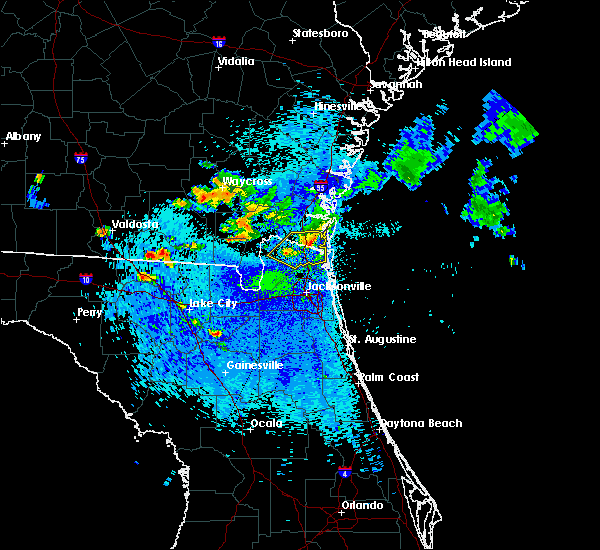 this storm was located near yulee, or 9 miles north of jacksonville international arpt, and moving north at 25 mph. penny size hail may also accompany the damaging winds. 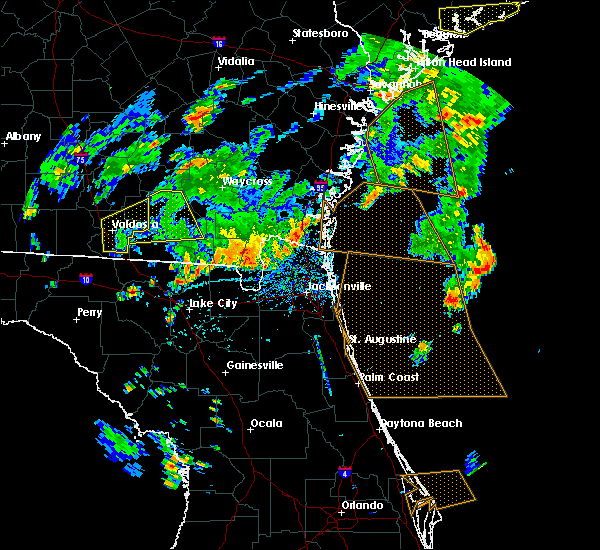 6/19/2015 5:42 PM EDT At 542 pm edt, doppler radar indicated a severe thunderstorm capable of producing damaging winds in excess of 60 mph. this storm was located near kingsland, and moving north at 15 mph. penny size hail may also accompany the damaging winds. 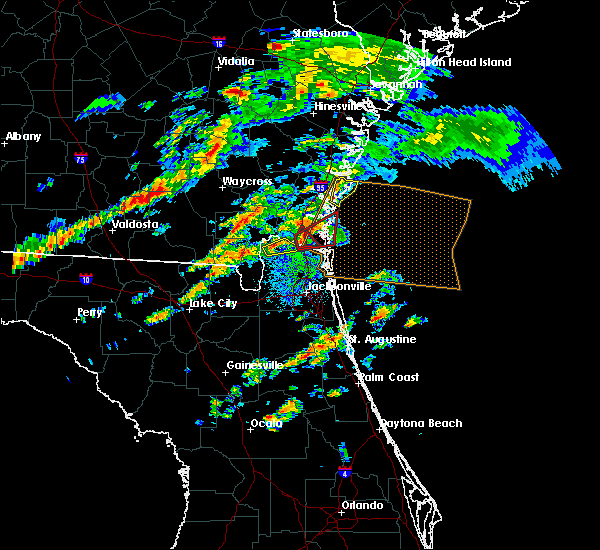 6/3/2015 3:46 PM EDT At 346 pm edt, doppler radar indicated a line of severe thunderstorms capable of producing damaging winds in excess of 60 mph. these storms were located along a line extending from near st. marys to near hilliard. these storms were nearly stationary. 5/19/2015 4:42 PM EDT At 442 pm edt, doppler radar indicated a severe thunderstorm capable of producing quarter size hail and damaging winds in excess of 60 mph. this storm was located near kingsland, and moving southeast at 15 mph. 4/25/2015 9:44 PM EDT At 944 pm edt, doppler radar indicated a line of severe thunderstorms capable of producing quarter size hail and damaging winds in excess of 60 mph. these storms were located along a line extending from 8 miles south of hickox to near race pond to 11 miles north of fargo, and moving east at 70 mph. 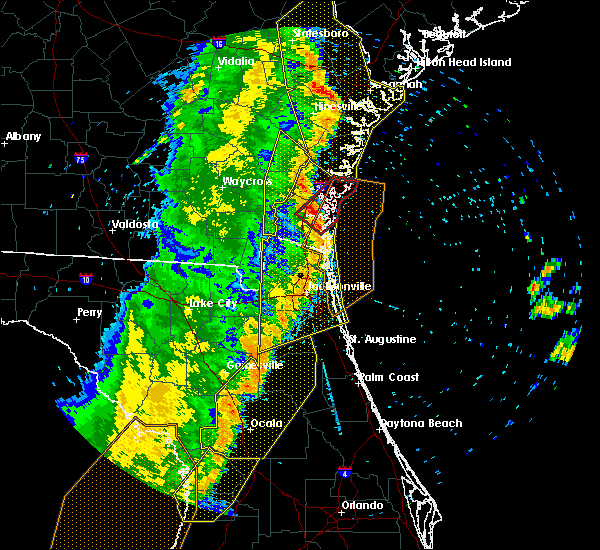 4/19/2015 4:55 PM EDT At 455 pm edt, doppler radar indicated a line of severe thunderstorms capable of producing damaging winds in excess of 60 mph. these storms were located along a line extending from near race pond to near folkston to bryceville, and moving east at 55 mph.